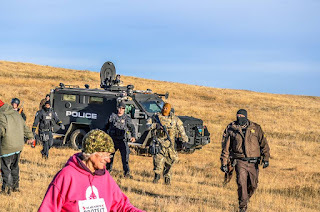 CANNON BALL, North Dakota — The Standing Rock Sioux Tribe today formally requested that the Department of Justice investigate law enforcement abuses, including unlawful arrests, of peaceful protesters protecting sacred places and water from the Dakota Access pipeline. Tribal Chairman Dave Archambault, II, called on U.S. Attorney General Loretta Lynch to investigate civil rights violations. 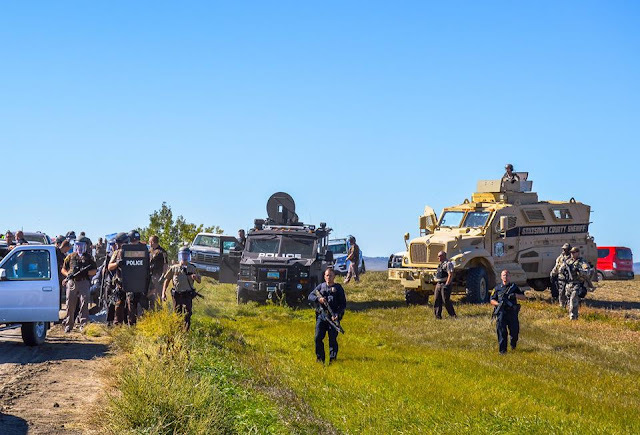 The militarization of law enforcement agencies has escalated violence at the campsite, protesters and tribal members have reported. Thousands of peaceful protesters from around the country have joined the Standing Rock Sioux Tribe in solidarity to protect sacred places and water. 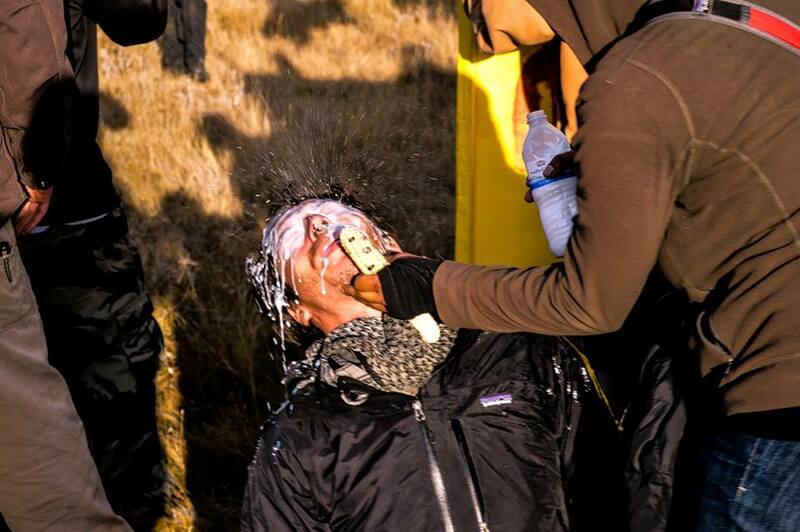 First-hand accounts and videos filmed by participants reveal a pattern of strong-arm tactics targeting Native Americans and peaceful protesters. The abuses include strip searches, violent security dog attacks, pepper-spraying of youth and intimidation by law enforcement. More than 300 tribes, millions of supporters, 21 city governments, 19 members of Congress and several members of the U.S. Senate have enlisted their support to protect water and sacred places. 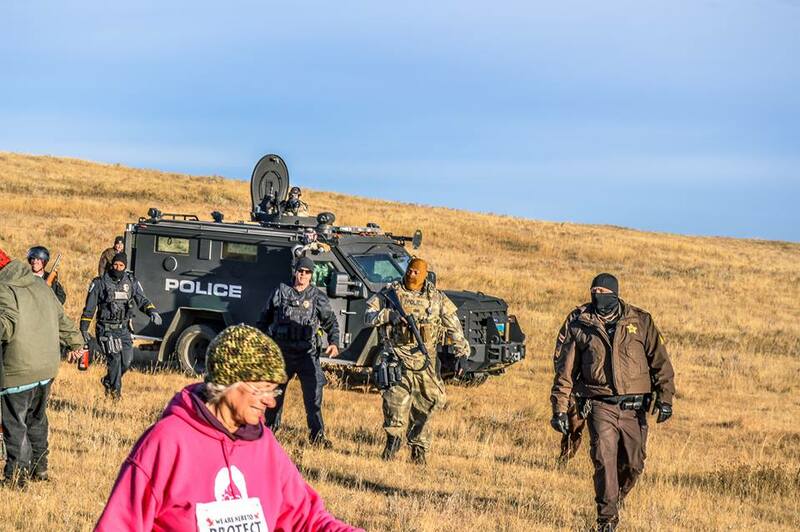 North Dakota’s Governor and congressional delegation—all of which support energy development—have together failed to provide leadership on finding a peaceful solution to address tribal concerns over the pipeline. 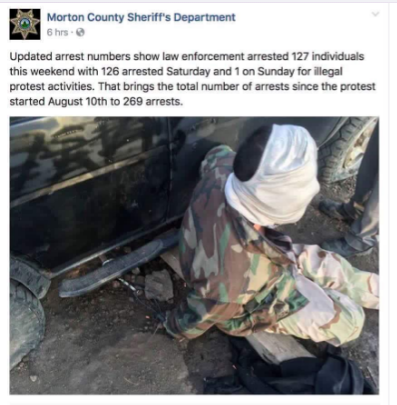 By Brenda Norrell -- Morton County engaged in torture when it hooded a Standing Rock water protector during a lock down to protect the Missouri River water from Dakota Access Pipeline construction. Morton County Sheriff Kyle Kirchmeier posted this photo. Morton County engaged in a second act of torture when it forced the daughter of LaDonna Brave Bull Allard to remain naked in a jail cell. She was arrested for no credible reason, strip searched and forced to remain naked all night. Forcing a person to remain naked is a form of torture. Excellent idea, one which perhaps should have been pursued earlier. I just hope that there Is a timely response. However, even the potential entry of this new player should give the locals a pause for thought. North Dakota, another example of the corrupt Industrial, Military, Prison system. Conviction rates in America can be 88 percent or higher, so innocent citizens go to jail. America, pre Trial waits in jail can often be longer than what the sentence would have been. Do deputies joke around about arresting people they don't like because deps can get 'em thrown in jail innocent or not? Oh! Prosecutors fabricate evidence, lose evidence that would prove a person innocent, encourage police to lie, and sometimes become judges. What are the judges like ? Look at mass incarceration in America. In many American cities its ILLEGAL to give food to homeless people! (As in setting up tables in a park and distributing food). Once in prison, prisoners have to work as slave labor for private-for-profit companies. and No JUDGE has the courage to do anything about it. Racism is rampant. Families don't get face to face visits, its video visits, and if prisoners complain there is punishment. 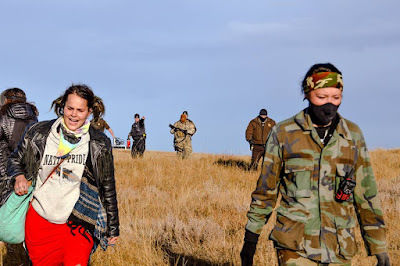 The excessive prosecutorial charges & human rights violations of the Water Protectors is showing the rot in the criminal justice system in North Dakota. *Sturgeon,Pallid inhabits Missouri & Mississippi Rivers.